The first time I encountered throwing stars (aka Hira-shuriken or Shaken) it was in a context that had nothing to do with Japan or the Orient. I was reading a Sword and Sorcery book and in one section the heroine (Raven, the Swordsmistress of Chaos) defends herself with "Xandian throwing stars", hitting her foe in the throat and through the vision slot of his helm. Years later I discovered that these fantastical weapons had a historical basis. 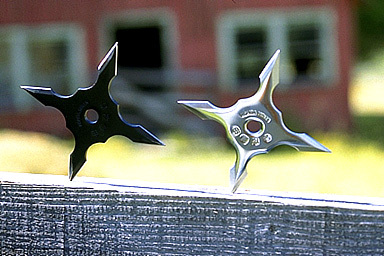 Throwing Stars are not uniquely Japanese, as can be seen in certain designs of Chinese Piau. There are many theories about the origins of Shaken, but I'll not recite them here. The idea must have occurred to nearly anyone who has ever tried to throw a knife. I remember classmates making throwing stars in metalwork, and back then they'd never heard of Ninjitsu, or Raven, for that matter. Nowadays there are numerous designs of Shaken available, though in some states or parts of the world their possession is serious crime. Where legal, Shaken throwing can be a entertaining diversion. The most famous users of the Shaken are probably the Ninja. Legend has it that they had many styles of throwing, including throwing when running and throwing with the minimum of movement. I'll detail just the basic throws -the variations you can have fun working out yourself. The Vertical throw -used for long range throwing -up to 15 metres. This is basically an overhand throw much like throwing a knife. In Ninjitsu it is often done by starting in a "Horse" stance. Hold the Shaken in the rear hand up near the ear. Make the throw as you step forward with the rear foot into a Front stance. Release the star just as your arm reaches horizontal and release with the spirit of "pressing" the weapon into the target -don't allow the wrist to snap or flick. The Horizontal throw is used for shorter range throws since it makes you less of a target. More like a Frisbee throw. Again start from horse stance, but hold the star in the forward hand and place this hand near the rear hip. Swing the hand outward, palm up, as you sway forward. Release the star as the arm points towards the target and once again, "press" it towards its destination. The Hip Pocket Throw. The Hip Pocket throw is another horizontal throw, but made with an inward motion, as if the weapon has been drawn from a pocket then thrown. The hand is swung inward in a quarter arc and the star released with a snap of the wrist. There are lots of other ways to throw shaken, and inspiration will be found in other sections on the Thrower pages. Like a knife, a star must be spun on its shortest axis to ensure that it arrives edge on. A properly designed star has a hole in its center or is thickened in this area to ensure correct balance and aerodynamics. If your Shaken is hitting side on then the fault may be in your grip. For horizontal throws the star is often pinched between the thumb and forefinger, making use of the centre hole. A simple pinch grip on one of the points may work for vertical throws. If not then try pointing your forefinger forward and holding it with thumb pressure and your second or lower fingers wrapped around a point. A variation of this is to hold the star as described but hook the forefinger around another point. Different holds will suit different throws or designs of star. Wolfgang Ettig's book (see Piau for reference) describes a range of modern Shaken, some as big as 13.5cm in diameter and weighing 115gms. Most, however, are in the 40-65gm, 7-10cm range. I've seen some evidence that many of the Shaken used by the ninja were larger than those commonly on sale today, but even if this is true Shaken were unlikely to be effective weapons unless used with some form of poison. For a number of reasons, Shaken do not penetrate that well. Traditional Shaken used in battle were mainly used as a poison delivery system. It a little surprising that features such as barbs are not seen more often. In his book on Shaken (Paladin press), Sid Campbell notes that for a star to penetrate four inches it would probably have to be ten inches across. There are very few areas on the human body where a hit from an unpoisoned Shaken can produce a fatal or even a disabling wound at this depth, and those areas there are tend to be very small. Your chances of hitting them in a combat situation are infinitesimal. To be honest, without poison a Shaken is a pretty ineffective weapon, being mainly a harassment and at best a distraction. In this context, chromed Shaken that the foe can see are coming may be more effective that the black ones he won't notice unless they hit. For self defence, an unpoisoned Shaken should be used as a distraction, in conjunction with evasion or close combat techniques. The thrower stands perpendicular to the target. "Forward" will indicate any movement towards the target, irrespective of facing. Weight is shifted to the rear leg as the shaken is drawn from the breast pocket. The thrower steps toward the target into horse stance, executing a horizontal throw. The throw is made just before the forward foot touches the ground. The thrower sways towards the target and his rear foot steps forward into Zenkutsu dachi. Step forward again into an Oi-zuki lunge punch. 1 & 2 ) Optimum target is the throat though this can be obscured by the chin so the thrower drops to a low stance and casts upwards, utilising his forward motion. 3) The low posture adopted means that follow up attacks are best made with a style such as Karate or Tae Kwon Do. The sway of the body adds momentum should the throw be late and assists in moving to the next stance. (Stances should be dynamic and are transitional rather than static). 4) Hips squared to the target and the front leg brought forward with force to knock any obstructions away. Part of the above article has been published previously in Scott Gracia's Great Throwzini newsletter. Some Previous Posts to "Thrower" on Throwing Stars. Idle moment today I was thinking of a section in one of my shuriken books. It shows 8 armed trefoil-pointed baby shuriken weighing 10gms and 6cm in diameter. These are described as being used as a shock weapon thrown 10-15 at a time. Ok, but I'm not convinced a handful of chilli isn't better. Seemed to me the best way to do this is to have the Baby Shaken in some form of holder like a roll of coins. While I'm thinking of the form of such a device something else surfaces in what passes for a intellect. Ninja used to throw caltrops too! Now when I read that many years ago I assumed it was single caltrops. Suddenly it occurred to me that a hand full of small ones could be thrown like the Baby Shaken and the ones that didn't stick would still be a hazard to an attacker. I recalled a very simple design I'd seen that was simply an equilateral triangle with one point bisected to the centre and half of this bent 90°. Grabbing a handy piece of tin and the tinsnips and centre punch and I had four in two minutes. (You get four with 30mm sides from a 60mm triangle -no wastage of material). First thing I found was that you could stack these in a very small space and I guess they'd slide around less than Shaken. When thrown they separated nicely. Also tried holding them together with a paper clip or paper fastener and throwing them while holding that, and got some good results. Now these I made were tin plated steel from a can, weighed 0.8gm and were not sharpened other than the sheared edge- I actually got them sticking in cardboard at a couple of yards! I threw them singly and as a group, and very pretty they look as they fly through the air to stick in the target, like origami birds. Scattered around the target when they miss they look far more sinister! Not a missile to throw overlong grass! I made the tin ones just to see how they stacked and flew. That they could stick was a real surprise. Making them from heavier material shouldn't take much more effort. They should be easier to make than most of the home-made shaken discussed, and they really are quite pretty. TWO METHODS OF NAIL AND WASHER SHAKEN. > Awhile back, somebody wrote to suggest John Deere tractor sprockets. "Here's how we did it as kids - we had never heard of or seen a throwing star, but were just looking for something to throw that would always "stick". This is something easily made by ten-year-olds, so be careful letting your kids see it! Get two large washers, and put both of them on a bolt. Thread on the nut, but don't tighten it. Put six or eight nails between the washers. >5 nails, around 3 inches or so long. your "tampering" down the end of the bolt) next, throw the thing as hard as you can at a younger sibling or a nagging wife. metal stub that was only about 1.5 inches long. At first I tried to jam these together as a makeshift knife and this was only slightly successful. The only success I did have was in using this item as a sort of throwing star. It was totally unsymmetrical and barely balanced but it worked. The two sides pivoted around the pin (which happened to be the centre of gravity) and no matter which end I gripped it from it would almost always nail the target and stick! The obvious exceptions being when neither of the sharp ends made contact but the two blunt ends did. I hadn't removed the other plastic handle because it keeps it balanced. It's about as un-orthodox a throwing star you could think of and only an idiot novice would try it but hey. The Shirakami style of Bo-shuriken throwing and a more conventional technique.